Marshall, Tabitha. "Phil Edwards". The Canadian Encyclopedia, 05 January 2017, Historica Canada. https://www.thecanadianencyclopedia.ca/en/article/phil-edwards. Accessed 20 April 2019. Philip Aron “Phil” Edwards, runner, physician (born 23 September 1907 in Georgetown, British Guiana [now Guyana]; died 6 September 1971 in Montréal, QC). Nicknamed the “Man of Bronze,” middle distance runner Phil Edwards won five bronze medals at three Olympic Games in the 4x400m relay (1928 and 1932), 800m (1932 and 1936) and 1,500m (1932). Philip Aron “Phil” Edwards, runner, physician (born 23 September 1907 in Georgetown, British Guiana [now Guyana]; died 6 September 1971 in Montréal, QC). Nicknamed the “Man of Bronze,” middle distance runner Phil Edwards won five bronze medals at three Olympic Games in the 4x400m relay (1928 and 1932), 800m (1932 and 1936) and 1,500m (1932). He was the most decorated Canadian Olympian until 2002, when speed skater Marc Gagnon won his fifth medal, tying Edwards’s record. In 1936, Edwards became the first recipient of the Lou Marsh Trophy as top athlete in the country. A graduate of McGill University medical school and star of the university’s track team, Edwards later became a leading expert in tropical diseases. Phil Edwards was born in Georgetown, British Guiana, to a family of 13 children. His father was a magistrate, and the family was part of the Black elite in the British colony. Edwards attended the prestigious Queen’s College in Georgetown and, at age 16, dominated track events at the school. After graduating, he left British Guiana and moved to the United States, enrolling at New York University (NYU), where elder brother “King” was already a student athlete. Edwards’ parents and several of his siblings also emigrated to New York, where they founded a law and real estate firm in Harlem (one of his sisters became the first Black female lawyer in New York state). Under the guidance of NYU coach Emil Von Elling, Edwards steadily improved as a runner, particularly in 880-yard races (roughly equivalent to 800 m). In the summer of 1927, for example, he narrowly missed winning the US national title in the 880-yard event. Despite his obvious talent, Edwards could not compete for a spot on the US Olympic team as he wasn’t a citizen and, at the time, his home country, British Guiana, did not have an Olympic team. However, as a British subject, Edwards was eligible to compete for another country within the empire. In 1927, Melville Marks “Bobby” Robinson invited him to join the Canadian team for the 1928 Olympic Games in Amsterdam, The Netherlands. (Robinson, who was manager of the track and field team, had also helped found the Hamilton Olympic Club and would later bring the first British Empire Games to Hamilton, Ontario, in 1930.) 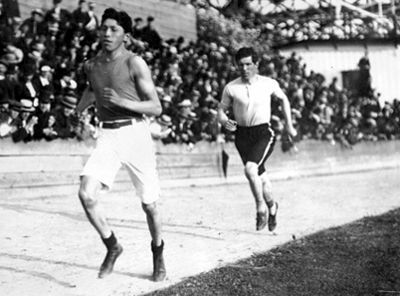 In late June 1928, Edwards competed at the Canadian Olympic trials in Hamilton, winning the national title in the 800m and qualifying for the Games. At the Amsterdam Games, he placed fourth in the 800m and won a bronze medal as a member of the 4X400m relay team. Phil Edwards of Canada (centre) competing in the men's 800 metres race during the IX Summer Olympic Games, 1928. 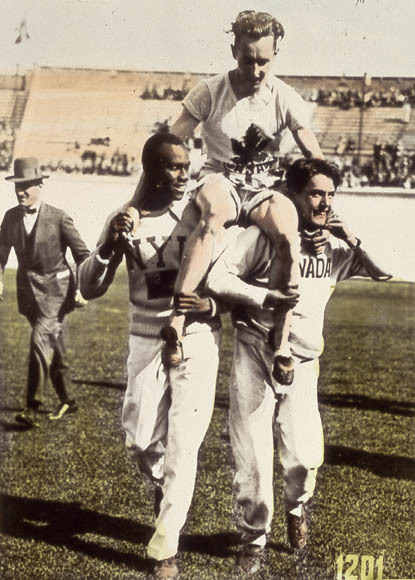 Percy Williams on the shoulders of his teammates after winning a gold medal in the men's 100 meters race at the VIIIth Summer Olympic Games (1928). Phil Edwards on left. The Central Canada exhibition came to a close yesterday with the holding of a mammoth sports program, featured by the appearance of Canada’s great half-miler, Phil Edwards. The member of last year’s Canadian Olympic team, running in the colors of the Hamilton Olympic Club, was the stellar performer in a program which was studded with keen competition and brilliant performances by the best of Ontario’s schoolboy athletes. The dusky flier had no strong competition, but he gave an impressive and pleasing display to capture both the 880-yard senior run and the one-mile run. The Globe newspaper referred to Phil Edwards as the “dusky knight of the cinder paths,” while a 1932 article in the Montreal Gazette referred to him as “Dusky Phil.” The term “dusky” means “dark,” and was commonly used to refer to people with darker complexions, particularly those of African ancestry. Edwards continued to make headlines in the Globe, including reports about his personal life (“Phil Edwards to Marry,” 7 October 1929) and his academic plans following graduation from NYU in May 1930 (“Phil Edwards Plans to Attend Cambridge,” 2 May 1930). Despite his earlier plans to attend Cambridge law school, Edwards eventually decided to apply to medical school and, in 1931, enrolled in first-year medicine at McGill University. In June 1931, the Globe informed its readers of the news, remarking “the coming of the stellar middle-distance runner boosts McGill chances in the forthcoming track events, for Edwards is recognized as superior to any Canadian runner at his distances.” He lived up to his reputation, leading the McGill track team to six consecutive championships from 1931 to 1936. 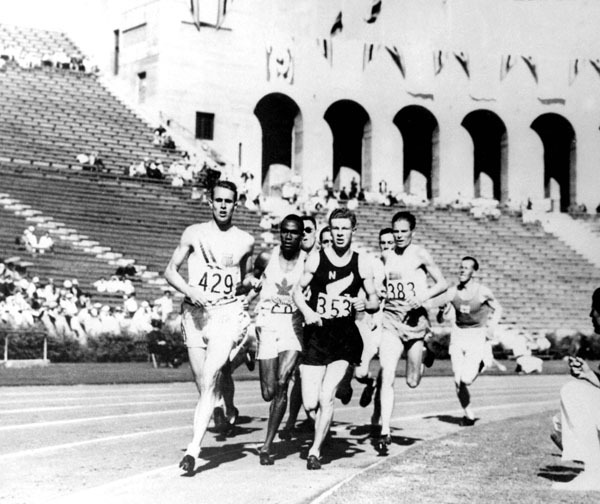 Edwards again competed for Canada at the 1932 Olympic Games in Los Angeles, California. During the 800m final, he set out at a blistering pace and led the race at the halfway point. However, at the final turn he was caught by Canadian teammate Alex Wilson and British runner Tom Hampson, both of whom broke the world record. Hampson won the race, with Wilson second, while Edwards hung on to take third. 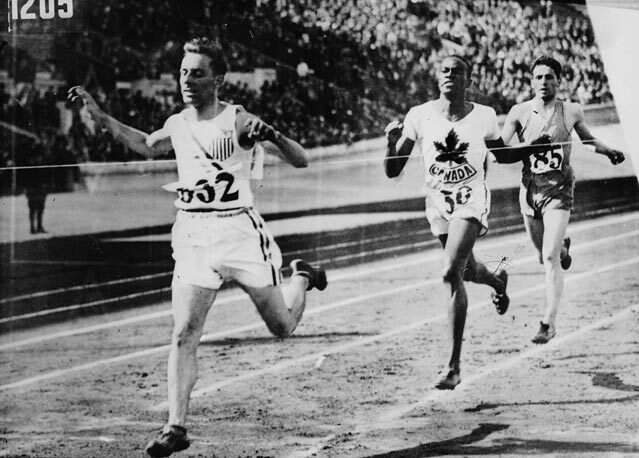 Canada's Phil Edwards (second from left) competes in an athletics event at the 1932 Los Angeles Olympics. Edwards won bronze medals in the 800 and 1,500m. He also won a bronze medal in the 1,500m, beating such favourites as American GlennCunningham and New Zealand runner John “Jack” Edward Lovelock. Edwards picked up a third bronze medal as part of the 4X400m relay team, along with Alex Wilson, James Ball and Raymond Lewis (the first Canadian-born Black man to win an Olympic medal). Phil Edwards won 3 bronze medals at the 1932 Olympic Games in Los Angeles. In total, he would win 5 bronze medals at the Olympics from 1928 to 1936. Edwards continued to train and race between the 1932 and 1936 Olympic Games, winning a number of titles, including a gold medal in the half mile at the 1934 British Empire Games in London (at the 1930 and 1934 British Empire Games, he was part of the Guianese rather than the Canadian team). 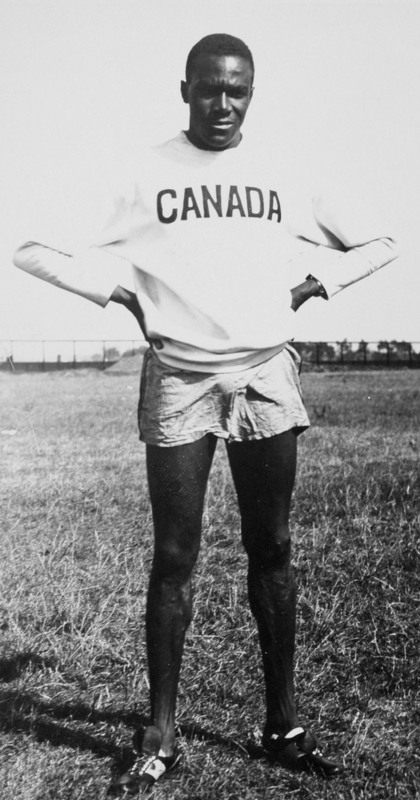 A veteran competitor, Edwards was chosen captain of the Canadian track and field team for the 1936 Olympic Games in Berlin. Also on the team was Sam Richardson, a Black track and field athlete from Toronto. Many Canadians (and Americans) wanted to boycott the 1936 Olympic Games because of Nazi Germany’s treatment of Jews and its ideology of White supremacy. However, others felt that participation in the Olympics would be a more effective challenge to Nazi ideology. In addition to Edwards and Richardson, Jewish basketball star Irving "Toots" Meretsky competed at the Games as part of the Canadian Olympic team. Edwards won his fifth bronze medal at the 1936 Olympic Games when he was narrowly beaten by Italian runner Mario Lanzi for second place in the 800m final. He then placed a respectable fifth in the 1,500m. Ironically, Edwards himself experienced racial discrimination not in Germany, but in London, England, as the Canadian team prepared to return home. When the team checked into a hotel, they discovered that the staff wouldn’t allow Edwards to register as a guest. Outraged on behalf of their captain, the entire team decided to leave (according to some accounts, Edwards was eventually allowed to register at the hotel, while others suggest the team found alternate accommodations). Later that year, Edwards became the first recipient of the Lou Marsh Trophy, awarded to Canada’s top athlete, as well as the Lionel Conacher Award for best male athlete. Edwards graduated from McGill University’s medical school in 1936. Although many assumed he would return to British Guiana to practise medicine, he instead accepted a three-year position at the General Hospital in Barbados as resident house surgeon. During the Second World War, Edwards served with the Canadian Army as a captain and was stationed in British Columbia, near the Pacific theatre. After the war he returned to McGill, earning a graduate medical diploma in tropical diseases in 1945. He remained in Montréal, eventually becoming head of the parasitology department at the Royal Victoria Hospital. An acknowledged expert in tropical diseases, tuberculosis and chest diseases, he was also a consultant for the Canadian government. Although Phil Edwards is sometimes identified as the first Black graduate of McGill University’s medical school, this is incorrect. Charles Lightfoot Roman, for example, graduated from McGill’s medical school in 1919. Edwards died on 6 September 1971—about two weeks before his 64th birthday—after a six-month illness. According to his obituary in the Globe and Mail, he had previously had surgery for cancer, but had later been “confined because of a heart ailment.” Edwards left behind wife Dianne and their three daughters. Edwards was Canada’s most decorated Olympian for about 70 years. 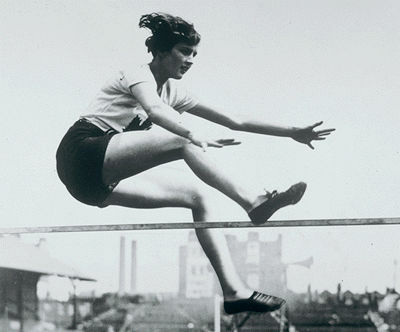 Before the 1932 Olympic Summer Games in Los Angeles, a number of Canadian athletes (George Orton, Robert Kerr, Percy Williams, Fanny Rosenfeld and Ethel Smith) had each won a total of two Olympic medals. When Edwards took three bronze medals at the 1932 Games alone, he entered the record books. His career total of five Olympic medals would not be met until Marc Gagnon won his fifth speed skating medal in 2002. Racial discrimination was and would remain a problem in Canada. During this period, Black Canadians were effectively segregated in many public spaces, Jewish Canadians faced widespread social, professional and economic discrimination, and Chinese people were banned from immigrating to the country. However, Edwards was much loved and admired, by his teammates and the public. A five-time Olympic medallist and Olympic team captain, he became a popular figure in Canada, with newspapers styling him the “dusky knight of the cinder paths.” The first recipient of the Lou Marsh Award for best athlete in the country, Edwards became a hero to many Canadians. At the time, races were run on cinder tracks — these were constructed from a variety of materials, including small rocks and coal ash. The 1964 Olympic Games in Tokyo were the last to use cinder running tracks. All subsequent Games and major international competitions have used synthetic running surfaces. As synthetic tracks provide a superior running surface, it can be misleading to compare the times of modern runners to those from earlier eras. William Humber, A Sporting Chance: Achievements of African-Canadian Athletes (2004).